I fixed a bug where a character was able to walk on blocked tiles when a door/teleporter was next to a blocked tile. 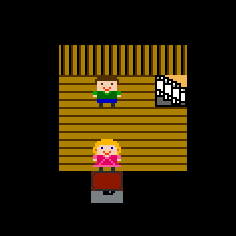 An example can be seen in the image above, the player walks on the stairs, the new world loads and he would have walked off the screen without a problem. Fixing this bug was important for allowing stairs in the corner of rooms.